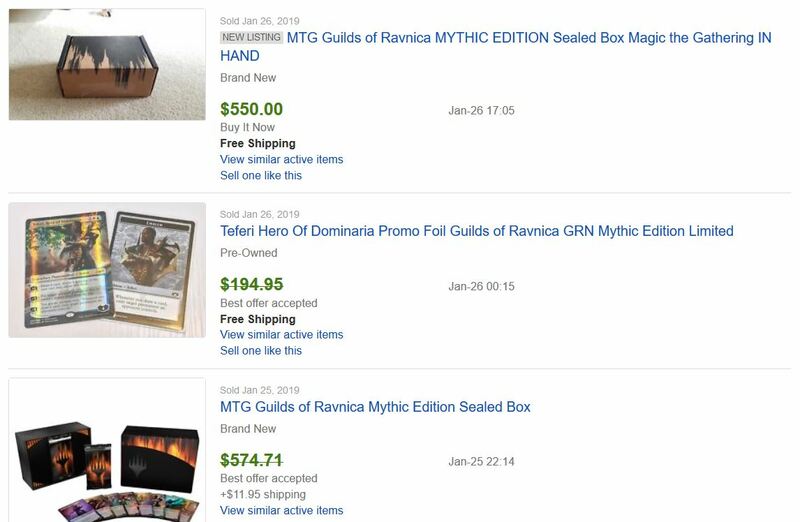 The current market price on the original Mythic Edition set, Guilds of Ravnica, is noted as about $500 on TCGPlayer. However sets on eBay are selling well into the $500’s. Teferi alone is selling well over $100. 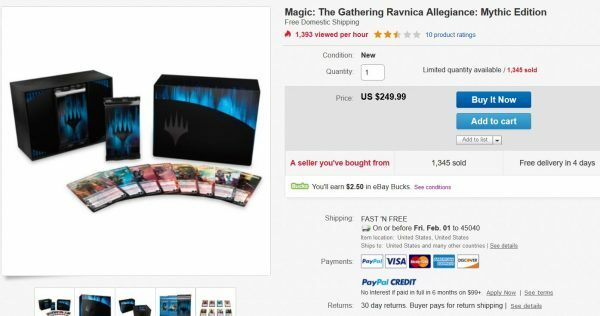 Based on the success of this product, it was natural for folks to assume the second version of Mythic Edition, Ravnica Allegiance, would be at least nearly as valuable. This is precisely why I purchased a box within seconds of their becoming available for sale on Hasbro’s eBay site. I was celebrating my guaranteed $100+ profit when I realized something: sales were slowing. Not only was the deceleration of sales significant, we also got wind of a “rumor” that there were nearly 20,000 sets available for purchase. In my typical risk-averse fashion, I promptly cancelled my order. A number of emotional factors contributed to my decision to sell, and it wasn’t all out of fear. First and foremost, I have absolutely zero interest in new cards. Spending $250 on a set of new cards is a tough pill to swallow while I’m actively saving resources for an Unlimited Mox Sapphire. In fact, my progress towards that Sapphire has been abysmal—I keep finding arbitrage opportunities that end up soaking up my cash. So when I purchased this Mythic Edition set, it actually took my MTG cash balance to zero. That wasn’t where I wanted to be. It meant that I would have no available funds to take advantage of upcoming opportunities (@MissouriMTG on Twitter has been offering a ton of deals lately). Essentially, my hands would be tied until I could flip this product. That’s when the second part of my emotions kicked in: why wasn’t this product selling out!? Everyone swore it was a slam dunk and represented free money. But if that was the case, people must hate free money because an hour after I cancelled I still saw only a fraction of available sets sold. That is a far cry from what happened the first time around. I woke up the following morning to find out the sets had “sold out.” The speculator community had done it! People claimed victory, assuring folks that sets would rebound in price now that these were no longer on the market at MSRP. But when I saw that only 9,339 sets had sold in that listing, I knew something was not right. Why would Wizards pull half the available supply so suddenly? The answer came later that day, when thousands more sets were re-listed at the same price: $249.99. As of this article’s writing Sunday morning, only 1,345 more sets had sold, bringing the grand total to 10,684. Just over half the initial supply. Here I am sitting on my computer, eBay site open, wondering if I should purchase this set again. There is plenty of supply, still, and I could reap the “guaranteed” profits still sitting on the table waiting for thousands of speculators to enjoy. The thing is, I still don’t want to buy this set. I’ll give you three reasons for this. I have no desire to keep this product. The planeswalkers look cool, but they don’t cost zero mana and tap for a blue. Therefore, I can’t play them in my Old School deck. I can’t readily flip the sealed product for profit. I know, I know. You’re going to tell me how you sold your set right away for $400 and made a decent profit. Maybe you’re one of the lucky people who cashed out before people saw that it had been restocked. I missed that window. At this point, there’s little room to profit from selling the sealed product. I also don’t want to sell above MSRP considering these are still $249.99 on Hasbro’s storefront. It is not my intent to charge people more than they have to pay for their cards—that’s not how I choose to operate. I don’t feel like doing the work it takes to crack all the singles and sell them all individually. If I were to try and cash out—and Hasbro still had stock on eBay—this would be my most likely avenue. You only need to average $35 per planeswalker and you could grind out a profit. In all honesty, this is the one thing that tempts me to still make a purchase. But because of the aforementioned reasons, I’m likely not to bother. Besides, there’s still a race to the bottom going on as speculators attempt to cash out of their product, and I don’t know what real demand is from the player base yet. With these factors in mind, I continue to drag my feet on purchasing this product despite the profits to be had. In reality, there’s really little reason for me to rush at this point. With thousands of products still available at MSRP on Hasbro’s site, I can take my time. There may be an advantage to being the first to list the singles for sale, but at this point the advantage is fading. If I were to place the order today and sell the singles in a few days when they arrived, I’d likely be looking at lower prices and a smaller profit margin. As long as there are still thousands available for sale, I don’t feel in any rush. Think about it. The print run of the initial Modern Masters was insufficient to meet demand and prices went ballistic. Any who got in near MSRP made significant profit. Then Modern Masters 2015 came along and margins were far less due to a larger print run. By the time Eternal Masters came along, there was little benefit to buying sealed product to flip. The supply was simply too much for the demand. How about the SDCC Planeswalker sets? Those first sets were so unique, generating demand from speculators and collectors alike. Their scarcity made the product even more desirable. A sealed SDCC 2013 set will now cost you nearly $500. But then they made a set in 2014. And 2015. And 2016, 2017, and 2018. Now the sets don’t hold the same allure they once had. SDCC 2017 sets are listed on TCGplayer for $215, less than half the 2013 sets. Whether due to greater demand or decaying interest, these sets just don’t hold the luster they once had. Next consider the Masterpiece series. Expeditions were the first of their kind and a huge success. So Wizards created a new version of the product again and again. Next thing you know, they ran out of cool ideas of which cards to reprint and the allure of a new, premium product started to fade. Granted the Kaladesh Inventions had a nice recovery. But the bottom line remains the same: Wizards likes to give us too much of a good thing. Could these Mythic Edition sets follow a similar course? Will they be released time and again, set after set, going forward? I believe it’s likely. Judging by previous trends, this means each time these are released the luster will dwindle and prices will drop. Perhaps the second set of these will still be desirable and hold value, but there’s no way they’ll be worth as much as the first. After writing this article, I still admit I am on the fence on these Mythic Edition sets. What tempts me most is the thought of cracking the packs and selling the eight planeswalkers individually. This seems to be the best way to flip the product for profit. But I still hold back because I’d rather accumulate cash to make other, more urgent purchases. The Old School market has calmed down and prices are once again attractive—I’d rather be putting my money there. If I had more liquidity, perhaps I’d be willing to sink $250 plus tax into one of these sets to try my luck with flipping the singles. But given my limited funds, I’m not sure I want to tie up that much money in this product. If you’re still on the fence, or if you just recently made a purchase, I’d highly encourage you to exit by selling the singles individually. However even as I say that, I may be causing the profit margins to shrink. The more people who decide to pursue this option, the lower prices will be on each planeswalker. This is the ultimate concern that keeps me on the sideline—if too many speculators are buying this product to flip, margins have to drop. In general, I try to avoid parking money into cards I think will drop in price. That’s not an ideal way of speculating, and the race to the bottom can leave a sour taste in one’s mouth. That’s not for me, honestly. I’ll stick to what I know and buy accordingly. Revised Bayou is back on Card Kingdom’s hotlist with a buy price of $175. I think dual lands may finally be bottoming after their recent pullback, and I still like holding these through 2019. If you are underexposed to the dual land market and are looking to park some cash for a while, I’d recommend taking a closer look. There’s been a good deal of chatter in the QS Discord chat about Massacre Wurm. Supply on this creature is quite thin and prices are steadily climbing. Card Kingdom has a buy price of $16.50, which is just a couple bucks below TCG pricing. Keep a close eye on this one. Card Kingdom used to hide their buy prices on the most expensive cards, instead using a comment about emailing the buyer. But they’ve changed back to posting prices again, and now we can see some pretty impressive buy numbers on Alpha Besides the obvious (Power, duals). It’s interesting to see the other cards they pay aggressively on. For examples, they pay $4200 on Chaos Orb, $2700 on Wheel of Fortune, $2520 on Birds of Paradise, and $1440 on Mind Twist. These are some mind-boggling numbers! What frustrates me is I feel like some weird victim to some odd circumstances. The last SDCC Promo’s I tried to buy in at Hasbro’s site, the site crashes, and I didn’t get squat. RNA-ME comes along, and knowing it would be on Hasbro’s website, I elect to skip out. Sure enough, I was right; the site died, but this time WotC reimbursed people with free box toppers! Why did they not do this for the SDCC promo’s!? Okay, so I’m now batting 0 for 2, so this time, I decide to buy-in but because it’s on Ebay and I figured WotC would make things right. What I didn’t count on though was the poor sales not necessarily due to the poor power level of the Planeswalkers (we all knew that), but rather the high import fees outside the U.S., coupled with the transparency of the EBay HTML supplying buyers with the sales data! This compromises the set’s mystique, hurting sales among speculators. So I’m now 0 for 3 on these shenanigans. Frankly, I’m so frustrated, instead of spending $250 on this, I’m just going to stock up on dual lands. I would always buy dual lands over new cards. But that’s just me. Sorry to hear of your frustrations :-(.